Once I got the design figured out I had to sit down and make another colorway. My inspiration for both? The Pantone Fall Color Report. Love this season's palette! So that was yesterday's challenge - what's up for today? Today we aren't going to sit on the computer and look longingly at photos from Bead Fest posted by our friends on Facebook. Oh no, it's time to get out of the house and find something to inspire you. You can go to a farmer's market, craft show, festival, museum, gallery, bead store, antique store, book store, walk in the park - whatever you can fit into your weekend that will inspire you. Stuck at home? Talk a walk in your neighborhood with your camera and go on a color hunt, snapping photos of things you find interesting. My outing today ties into my friend Erin's latest challenge which calls for us to find inspiration in our hometown. I'm all about my hometown, I love this place with all my soul. 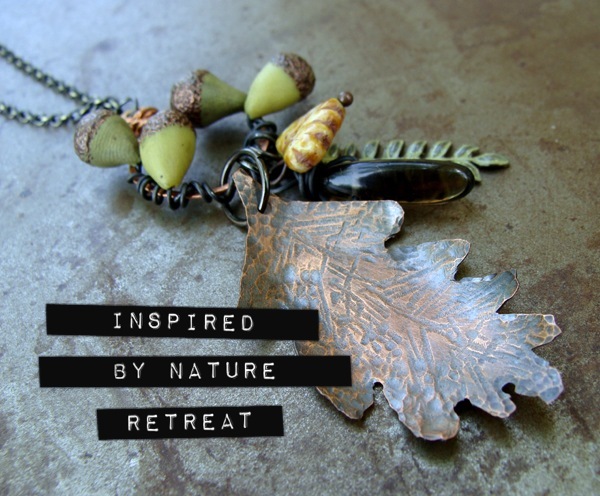 In fact, I host a fall Bead Retreat here every year to share these amazing surroundings. I'm going to go visit a local ceramic gallery that is out on a farm today - it's in the middle of nowhere. I will take my camera and see what my trip inspires. Do you have something planned for today - treat yourself to a little inspiration! Share photos from your adventure on your blog or the Creative Bead Chat facebook page. So, here is your chance to win a $50 gift certificate from Humblebeads.com. Today leave a comment and tell me what is the most inspiring place you have visited or dream of visiting one day? Earn another entry if you share my Retreat Link on twitter or Facebook. You have until Sunday to enter, leave a comment to let me know you shared the link. I will draw the winners on Monday morning.